When the family goes to see what the Easter bunny brought on Sunday morning, Fido doesn’t have to be left out of the festivities. There are tons of cute and fun Easter-themed treats and toys available for dogs and puppies. These Easter gifts for dogs are perfect to give on their own or to put together a dog’s Easter Basket. Check them out below and give your puppy a special surprise. Stuffed rabbits are a common gift in Easter Baskets, which makes this bunny dog toy a perfect gift for your pooch. This plush bunny is 6″ tall and features two squeakers to provide your pupper with plenty of fun. It’s also machine washable so you can keep it fresh year round. Marshmallow Peeps are a delicious addition to any Easter Basket, but they aren’t a good treat for dogs. 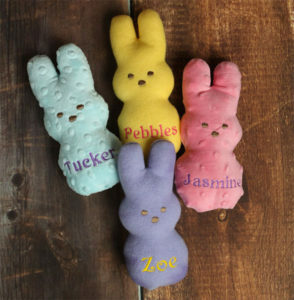 Instead, you can get your precious pup a personalized Peep toy. These handmade squeaky toys come in 4 colors of soft fleece, with your dog’s name embroidered on the stomach. These unique dog toys are 3″ by 6″ and make a delightful surprise for Easter morning. With everyone else in the family getting scrumptious candies in their Easter baskets, there should be some yummy treats for Fido too. These dog treats come in a beautiful Easter Egg box and look like delicious truffle candies. The 8 truffles and 1 cake bite are made from organic ingredients like free range chicken and cage free eggs (check out the full ingredients on Amazon). The box is 6″ x 4.5″. If you’re looking for Easter gifts for dogs, you should consider something dressy to help your puppy join in on the fun of the Holiday. 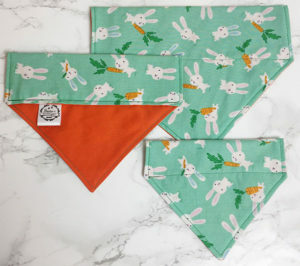 These cute bandanas feature a print of Easter bunnies and carrots, made from 100% cotton fabric. They are made to slip onto your dog’s collar, so your pooch can wear this bandana safely without choking. The bandana is available in three sizes. Another option for your doggie to dress up for Easter is these adorable floppy rabbit ears. These ears are custom made in your favorite colors and to fit your dog specifically. They’re better than rabbit ears found in petstores because they’re designed to stay on your dog’s head. This is a great, custom gift that will make all of your dog loving friends jealous. If you really want to go all out for the holiday, you can dress your puppy up for Easter. 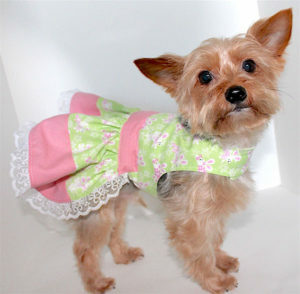 This gorgeous easter dress is designed specifically for your pooch. It’s easy to put on and features a fun Easter pattern of rabbits on pastel green fabric. The dress show is made for small dogs, but check out the seller’s other listings for more dog dresses and shirts. If your male dog wants to dress up as well for Easter, he’s in luck. 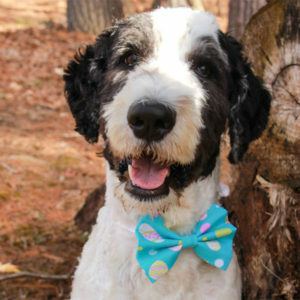 You can get him this adorable Easter dog bow tie. These cute miniature bow ties are handmade by Perry Wears for dapper dogs. They’re made to order in four different sizes and come with a velcro loop to easily attach it to any pet’s collar (these are great for cats too!). If your dog doesn’t like wearing clothes, you can still dress them up for the holiday. This adorable collar is bright yellow with cute decorated pink easter eggs all around. 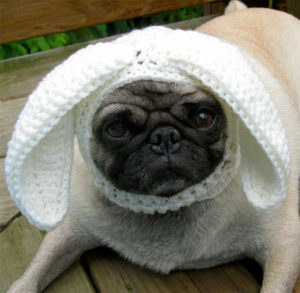 Your dog will be festively dressed without struggling to put a hat or shirt on him. Made from durable polyester, these collars are great for everyday wear and durable enough to wear outside for the Easter Egg Hunt. All collars are made in the USA. If you’re thinking, “All right, those clothes are cute, but we want to see more Easter gifts for dogs.” No worries! Check out this adorable hatching toy that is perfect for Easter. This hatching toy morphs from a round egg shape to a cute little chick your puppy will love to play with. Stuff the chick inside and let your dog pull it out–you can even add a few treats to make it even more fun. This toy features very little stuffing and a few squeakers to entice your pooch. If you’re looking for a tasty treat for your puppy that doesn’t look like candy but still has some Easter flair, check out these all natural dog biscuits. 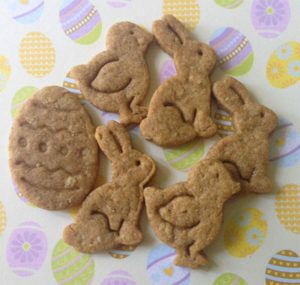 Homemade by Oscar Bites Dog Treats, these tasty treats are made from peanut butter, honey, and oats and come in festive Easter shapes like bunnies, chicks, and eggs. This shop bakes to order, so the treats you receive will be fresh. What a yummy Easter gift for dogs! If you want to get an Easter gift for dogs that will bring joy all year, check out this dog toy from ZippyPaws. This cute and festive bunny toy features 3 plush eggs that you can hide inside. Your dog will love trying to dig out the squeaky eggs. You can even hide some Easter treats inside for extra fun. Your dog will love this Easter egg hunt. Toy dimensions: 8.5 x 5 x 5 inch. I feel a little weird when I look at these dog treats–they look so yummy I want to eat them! These Easter dog treats take a boring biscuit to the next level with their delicious, decorative icing. 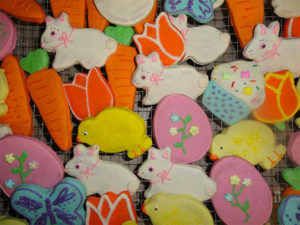 Homemade to order, these cookies feature brightly decorated Easter eggs, rabbits, carrots, and other fun springtime treats. Comes 3 to a package. We all know chocolate is a no-no for dogs, but that doesn’t mean you can’t give your pupper their own “chocolate” Easter bunny. 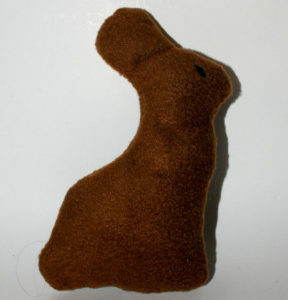 This adorable toy from Bow Wow Pet Wear is a fleece covered plush designed to look just like a classic chocolate bunny. These toys are handsewn and feature a squeaker inside. You get a choice of 6 colors when you order. If your dog is jealous of all of the Easter Bunny’s carrots, you can give them on of their own! 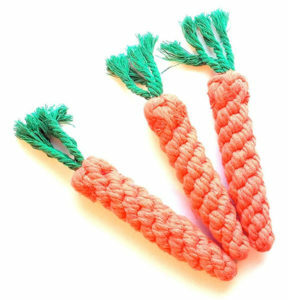 These carrot dog toys are made of sturdy braided rope, making them perfect for playing fetch or tug o’ war with your pooch. Each carrot toy is approximately 6.5″ long and would look great in your dog’s Easter basket. If you’re looking for Easter gifts for dogs that are far away, this one is perfect! This is a “Happy Easter” card designed just for dogs, as it’s completely edible! 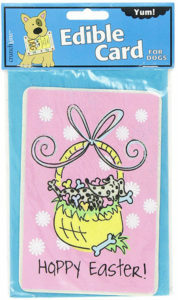 The card features a colorful image of a spotted dog enjoying an Easter basket of bones. The card is made of rawhide with non-toxic ink. It even comes with an envelope so you can mail it to your favorite pooch. Looking for more techy gifts for your pooch? Check out GoPro dog mounts and dog camera collars. Keep up with your dog’s health and exercise with these activity trackers for dogs. If you have a kitty in your house, check out these Easter gifts for cats.